Discover a PUMA Pocket Knife with startling, streamlined, space-age styling. Tuck a PUMA pocket knife away in your pocket and be ready for the little odd jobs you do every day. What are a few ways you'll use it? You've probably thought up some uses of your own. And you can expect your PUMA pocket knife to last a lifetime. Were you aware that the blade of a PUMA pocket knife is hot drop forged or laser cut from a 1" bar of Solingen steel just like PUMA's other knives? PUMA's craftsmen carefully select all of the knife's parts from premium quality materials, and assemble them to precise tolerances that result in knives that are attractive, durable, easy to carry, and a pleasure to use. The compact, classic PUMA Medici is a versatile PUMA pocket knife with an eye-catching style that has been popular since it was introduced. The PUMA Earl is a rugged, distinctive looking lock-back German Knife with staghorn scales and brass bolsters. It comes with a belt pouch. The PUMA Duke and PUMA Prince are two larger models in this series. The PUMA Corporal is a solid, durable lock-back that comes with ABS handle scales and a cordura belt sheath. The PUMA Hobbytec is a light weight lock back with composition handles, and is available with a drop point or clip point blade. The compact, light weight PUMA Backpacker is a lock-back PUMA pocket knife with a sand blasted finish that is built tough enough for hikers, backpackers, and boonie stompers. The PUMA Steel is an all stainless liner lock with a lanyard ring, and money clip built in. The PUMA Pilot is a lock-back with aluminum handles, that weighs in at only 40 gr. The handles have special stainless rivets, ABS scales, and a lanyard hole. A version named the Major is available with a 3 1/2" blade. It comes with a cordura belt sheath. The PUMA 4-Star Mini is a handy, compact knife available with handle materials of stag, buffalo horn, mother of pearl, jacaranda wood, bone, or stainless. 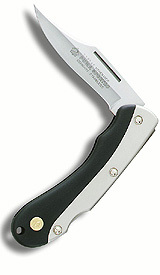 The PUMA Handic is a durable, liner lock type PUMA Pocket knife with a modern, streamlined style. The PUMA Sportec is a streamlined lock-back with composition handles, available with 3 1/4" clip or drop point blades. 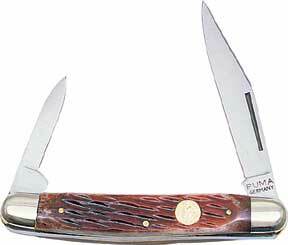 The PUMA Stock Knife is a 3 blade stockman style pocket knife, 4" closed length. There is a 3" clip point, 2" sheepfoot, and 2 1/4" spey blade. Handle scales are jigged bone or sambar staghorn. The PUMA Bantam is a PUMA Pocket knife with 2 440 A blades, and it's available with scales of staghorn, bone, or olive wood. The PUMA Pen Knife is a 2 bladed pocket knife that is 6" in length with both blades open. There is a 2 3/4" spear point, and a 2" small spey blade. Handles are available with scales of staghorn or bone. 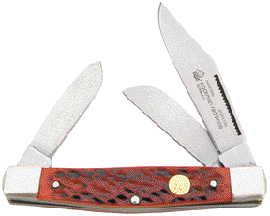 There are a variety of other models and styles of German made PUMA Pocket Knife available. Take a close look at them the next time you're in your favorite knife shop. You'll have some fun, and you might find it difficult to resist the temptation to buy one. Return from PUMA Pocket Knife to the German Knife .com home page.